In Memory of Apostle Joann Long, who died of cancer this past week. We were drawn to her wisdom of being forthcoming about anything and everything about life and in the “name of God”. One thing that had Chicago, back in the 80’s was her testimony of how she overcame some obstacles that only God could do. She shares her life about being married to a minister Tracy Lamar Allen, who was living on dual lifestyle… He was bisexual and contracted AIDS… he later died. Her heartbreak to forgive and God blessed her with the love of her LIFE… She found love again… I wanted everyone to know she did write this book that might be on Amazon or maybe you can order the book through certain bookstores… It’s called …. A MIRACLE OF LOVE… By Joann Long. Dr. Joann Long went around the country exposing the issues of life inside the church and outside of the church. Her ongoing fight to expose the ignorance that runs amuck in the church about homosexuality and the dual lives of ministers. Her message uncovered many things about the hidden lifestyles of others. And the importance of celibacy before marriage. Very little talk or classes even teach celibacy today. She was so well-respected from where I came from. She stirred up our purpose as women to wait on the man or woman God sends. She advocate the posture of keeping the family structure and expose the lies that attack marriage and the family. 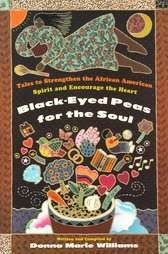 Black Eyed Peas For The Soul by Donna Marie Williams… also shares her story of joy and pain! Lets awaken about the hidden truth about what the church actually “steer clear” of and that is real talk, and real conversation. We can’t paint a glorious church until we expose so much that the church keeps in secrecy.